Honestly though this was a devastatingly hard year, politically, professionally, and personally; and it was the fifth such year in a row. Breaking my leg was the least of it. It was too blustery to ride today, but too sunny to stay inside, so Jeremy and I went for a walk in Heron’s Head Park. 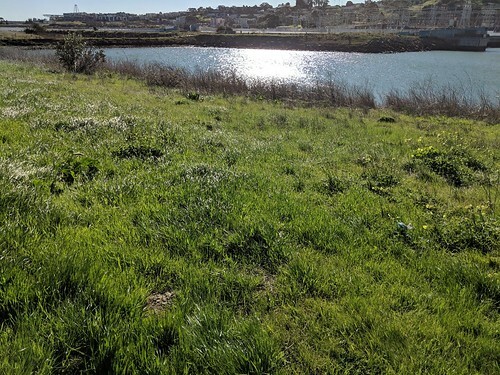 It’s the site of a never-completed shipping terminal, next to the decommissioned Hunter’s Point Power Station, not far from where Islais Creek, our local watershed, meets the Bay. Back in the 90s, citizen activists spearheaded wetlands restoration and now it’s a sparkling salt marsh, a magnet for pelicans and sandpipers. 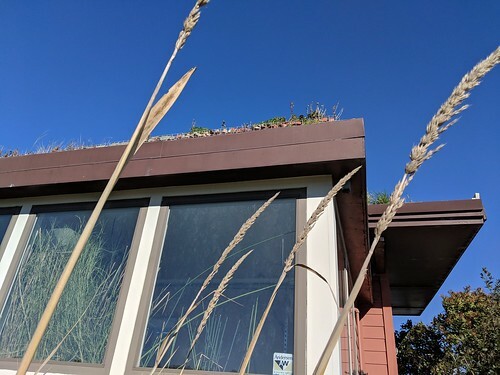 There’s an eco center with a living roof. We walked and talked for a long time, and then dropped by Bay Natives nursery and bought some eggs still warm from the nest. Reclaimed Industrial Landscape is one of my top three aesthetics, and my hope for the new year is that the same transformation can happen in my cold dead heart. This entry was posted on Monday, December 31st, 2018 at 3:35 pm and is filed under adventure time, grief, little gorgeous things, mindfulness, san francisco, sanity. You can follow any responses to this entry through the RSS 2.0 feed. Both comments and pings are currently closed.